A Gay Pride march in Jerusalem has taken place amid tight security, sparking fierce protests among the holy city's religious communities. 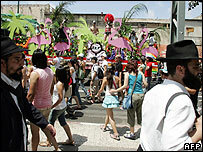 An ultra-Orthodox Jewish man was arrested for planning to bomb the parade, Israeli police said. At least 18 other people were arrested during the march, which came after Israel's High Court rejected an appeal by religious groups to ban it. More than 7,000 police were deployed to secure the parade to prevent clashes. Israeli police spokesman Micky Rosenfeld said officers found an explosive device in the bag of the alleged bomb plotter. "He admitted he planned on planting it on the route of the parade today," Mr Rosenfeld said. At least 15 people were arrested for throwing stones at police on Wednesday night after the court appeal was rejected. About 2,000 people joined the march, holding bright balloons, singing and holding posters of Nelson Mandela and the Dalai Lama, the Associated Press news agency reported. March organisers said they were expecting 5,000 people to attend. "We are thrilled to be here today, celebrating our freedom of speech in the centre of Jerusalem," Noa Satat, chairwoman of gay-rights group Open House, told Reuters news agency. Several hundred ultra-Orthodox Jews held protests against the parade at the entrance to the city, setting rubbish bins on fire and waving banners that said "Shame". The community has protested repeatedly against the march in the past week, burning tyres, confronting police and damaging police cars. More than 1,000 firefighters went on strike last week, refusing to grant a licence to the parade's organisers, forcing them to cancel a rally at the end of the march. The event, held in Jerusalem since 2001, has been denounced in the past by conservative Jewish, Christian and Muslim groups which share a view that homosexuality is an abomination. But civil liberties groups argue that it celebrates diversity in the holy city. "The question of 'why in Jerusalem' is not a question. It is the same question as letting women vote," said Dana Olmert, herself a lesbian and daughter of Israeli Prime Minister Ehud Olmert, in an interview with Israel's Army radio. Last year, it was relocated to a sports stadium because of security concerns. In 2005, an ultra-Orthodox Jewish protester stabbed and wounded three people despite a heavy police presence at the event. Gay activist Adam Russo, who was one of those stabbed two years ago, told the BBC that homosexuals had the right to march through the city. "We are all frightened but I'm here because of my right to protest," he said. "I will be not be shut down by anyone. Jerusalem is the place where we should parade." Israel's largest annual Gay Pride parade held in the mainly secular city of Tel Aviv passed off peacefully earlier this month. About 20,000 people attended the event.